Third Eyesight was recently asked by a multi-billion dollar global consumer brand to facilitate a round-table discussion focussing on the issue of how to drive ethical behaviour and sustainable business models into their sector. This company has a well documented strategy and action plan until 2020, and their team was travelling together in India visiting other corporate and non-corporate initiatives, to learn from them. For the round table, we brought together brands, retailers, manufacturers, compliance audit and certification agencies, craft and community oriented organisations and non-government organisations (NGOs working on environment stewardship. Some were intrinsically linked to the consumer goods / retail sector, others were not. Among those present was Ramon Magsaysay award winner Mr. Rajendra Singh of the Tarun Bharat Sangh, an organisation that has, over the last several years, worked in recharging thousands of water reservoirs leading to the rebirth of several rivers. The diversity (and sometimes total divergence) in views among the participants was a powerful driver for the debate during the day, which was the main intention behind having a really mixed group. At the end, though, the result was productive, since the divergent perspectives opened avenues that may have previously not been visible. How are learnings from green factories consolidated and disseminated to other suppliers? How do companies plan to continue to support sustainability and corporate responsibility initiatives considering the drastic economic changes and the dire retail scenario? What does fair trade have to do with sustainability? Why labour laws are not being followed? Are the laws outdated and impossible to follow? Are there any other reasons, which could be dealt with by companies themselves? Can consumer consciousness and pressures be brought to bear? Does the question “Is the product I am buying ethically produced” come in the mind of an Indian consumer? Or even to the mind of the Indian retailer? The need to address the core issue of unbalanced demand and supply of workforce in cities. What should responsible and aware companies do to stop other companies from polluting rivers and water systems? 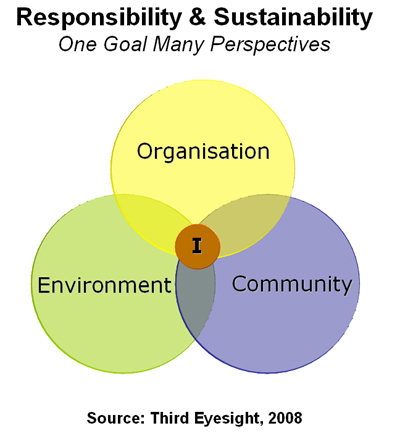 Most corporate responsibility / sustainability initatives end up addressing only one of the dimensions to focus and simplify the action-points. However, the reality is that there are many areas where the Environment, the Community and the Organisation overlap with each other – many a time, when you ignore the interaction between these dimensions, you get totally divergent opinions. And the point of view related to your own history, geography and experiences, further colour the opinion. The individual – “I” – as a citizen, as a corporate manager, as a parent of future generations, or in any other role, is at the overlap of all three external dimensions. That should tell us something about where the action needs to be initiated. In closing, let me come back to “Babel”. According to the Book of Genesis, a huge tower was built “to the heavens” to demonstrate the achievement of the people of Babylon who all spoke a single language, and to bind them together into a common identity. God apparently was not particularly happy with this self-glorifying attitude, and gave the people different languages and scattered them across the earth. Whatever your religious (or non-religious) affiliation, this story holds a gem of a lesson. No matter how noble the cause of the corporate responsibility warrior, it is good to be humble and allow diversity rather than trying to capture everyone under one monolith with an apparently common goal. The diversity may be a lot more productive and help to spread the benefits wider than one single initiative. The day that we spent on the sustainability round-table certainly demonstrated that very well. I agree that diversity of action is a good thing. But it’s not a panacea. Look at the ‘war against poverty’ e.g. in African countries where hundreds of NGO’s with wildly diverging strategies are involved. The results are mostly disappointing.